I would like to thank Formecology’s owner John Gishnock for providing me with this valuable information on Composting and I’d like to give them a plug! Composting is the biological decomposition of organic material into a humus-like substance called compost. The process occurs naturally, but can be accelerated and improved by controlling environmental factors. Each year half of the root system dies and is composted in the soil – Nature working itself! Where should I put a compost site? •Have a landscape plan ! 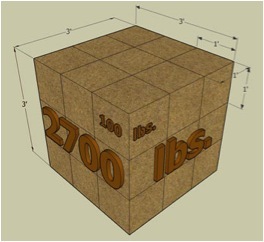 •The perfect size for a compost pile is one that is at least 3′ x 3′ x 3′. It’s not only a manageable size to turn, but it’s ideal for retaining heat while still allowing air flow. 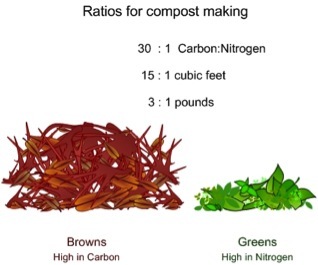 •Ideal ratio is about 25 -30 parts Carbon to 1 part Nitrogen. •If too much carbon, decomposition will be very slow. •If too much nitrogen it will smell. • Plants that have been treated with pesticides and/or herbicides (weeds and lawn clippings) should be avoided. •If temperatures get too high the beneficial microorganisms are killed. •After the first week to 10 days temperatures will moderate & pile should be turned less than 1x per week. •After 15-20 weeks the compost will be done. •The center of the pile will be slightly warm and original ingredients will be indistinguishable. •Shredding materials provides more surface area and encourages faster decomposition. 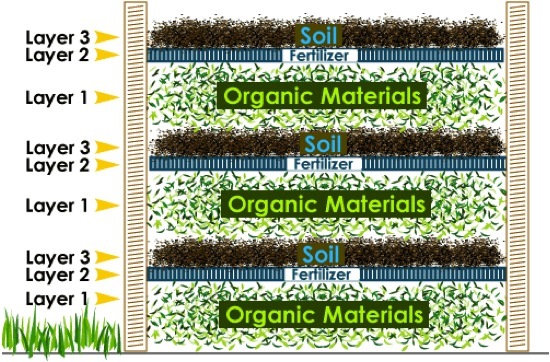 •Mixing/Aerating the pile with a pitchfork or using a tumbling system ensures adequate oxygen. •Adequate moisture is important- you should be able to squeeze a small amt. of moisture out but it shouldn’t be wet. 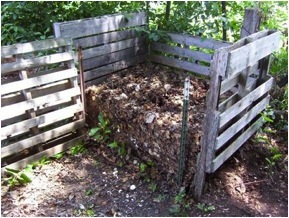 •Compost piles should remain damp but not too wet. As you build your compost pile, make sure that each layer is moist as it is added. The surface should also remain damp (think of a wrung out sponge), especially during the summer months. •Soak finished compost in water to “brew” compost “tea,” a nutrient-rich liquid that can be used for foliar feeding or for watering plants in your garden, backyard, or houseplants. •For faster results, use a compost turner every two weeks to aerate your pile. Great info Dan. Thanks for the plug too – we greatly apprecite the work you and Project Garden Share does. Thanks Gish! I’d like you to help me with a post about rain gardens next month. Now that’s a great post Danny! I can use this information. Formecology is an amazing firm. Thanks! I talk about heat under The H is O (a reference to a funny SNL skit) if you haven’t seen it, check it out. Thanks for your comment. So informative, thank you for this….I am lucky to have llama manure (beans) excellent fertilizer and perfect for making tea (fertilizer) for plants and gardens! Some of the best manure out there, small and breaks down fast. Thanks for your comment Jess! Reblogged this on Full Gamut Workshop. just yesterday I said to my daughter, “this is the year we start composting for real!” then lo and behold I find this posting. Thank you! I’ve bookmarked the permalink and will refer to it often! I also liked your chickens for the backyard info, too. Where we live, we could accomplish this as well! this is one excellent blog! I’m sure I’ll be checking in all the time! if you can get any fresh stinging nettles and yarrow, i’ve found that they help heat up the compost really well. i just make a hole in the middle, push them into the hole, and cover back up . . . .they break down from the middle and radiate out . . . .nice if you can forage for these plants where you live, they grow wild where i am. Also, try to locate your compost away from fruit trees. Thanks for the like! I have found this post to be very helpful. I have recently started my own garden and do a little composting myself (http://inherchucks.com/2012/01/16/how-is-my-garden-growing/). I will take what I learned here to improve on my methods. thanks!